In a food processor or blender, add rotel & onion quarters and puree until smooth. Place rice in a large mesh strainer and rinse under cold water until the water runs clear (about 1 minute). Shake strainer to rid rice of excess water. In a heavy oven safe straight sided saute pan or Dutch Oven, heat oil over medium high heat, cover and cook for 1-2 minutes. Drop a few grains of rice in the oil and if the grains sizzle the oil is ready. Add the rice and fry, stirring very frequently until the rice is light golden in color, approximately 6 to 8 minutes. Reduce heat to medium and add garlic. Cook for about 1 1/2 minutes, stirring constantly. Add in pureed tomato/onion mixture, chicken broth, tomato paste & salt. Bring to a boil. Once boiling, cover pan with a tight fitting lid and transfer to oven. Bake for 30 to 35 minutes, stirring halfway through baking, until rice is tender and the liquid is absorbed. Remove from oven and stir thoroughly. Add in cilantro and stir to incorporate. 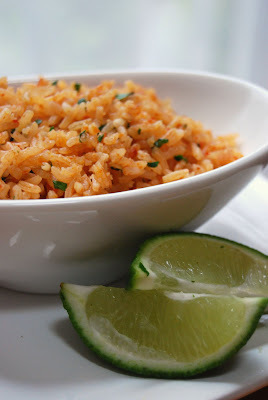 Serve with lime wedges if desired.